Counting sunspots over time helps in knowing the activity of our star but the two indices used by scientists disagree on dates prior to 1885. Now an international team of researchers has tried to standardise the historical results and has discovered that, contrary to what one may think, the solar activity of our times is very similar to that of other times, such as the Enlightenment. Scientists have been counting sunspots since 1610 with small telescopes. Thus it has been verified that the Sun's activity increases every eleven years, according to the interval in the growth of the number of darker and colder spots in comparison with the rest of its surface. The more spots that appear, the more luminous the surrounding areas are, and our star shines brighter. Nonetheless, the eleven-year cycles do not always have the same intensity. The more intense peaks of the Sun's luminosity were produced in the 20th century, which experts have called the 'modern maximum'. However, an international team of scientists has reviewed the historical data and has verified that there were also elevated values in other periods. "It has been a huge surprise to observe that in the 18th century the levels of the Sun's activity were practically the same as they are now," points out José M. Vaquero, researcher at the University of Extremadura (Spain) and co-author of the research, a review of the number of sunspots recorded in the last 400 years. 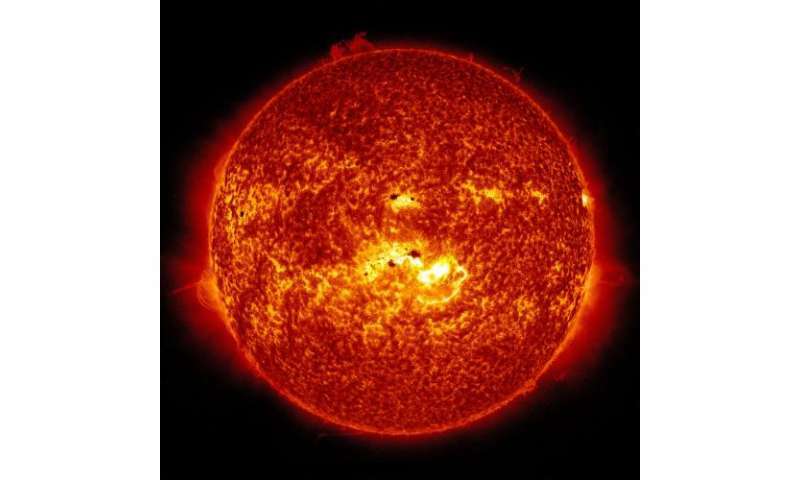 The results, published in the journal Space Science Reviews, also reveals that in other periods the opposite occurred, such as the Maunder minimum (1645-1715), when the sunspots practically disappeared and solar activity was drastically reduced. "A proper estimate of the past and present activity of the Sun, our main source of light and heat, is crucial in understanding numerous phenomena that occur on Earth, especially to rule out the role of the Sun in global warming," says Vaquero, "but we come up against the problem that two indices or ways of calculating historical solar activity exist, and their data does not coincide when describing what happened before the 20th century". The first index is the 'International Sunspot Number' or Wolf number, thought up by the Swiss astronomer Rudolf Wolf in 1849. It is currently the method followed by the Royal Observatory of Belgium, aided by a network of more than a hundred other astronomical observatories, the majority amateur. The second version is the 'Group Sunspot Number', and was created by US scientists Douglas V. Hoyt and K.H. Schatten in 1998. "Unfortunately these two series only coincide in the more recent period, from approximately 1885 onwards," points out Vaquero. "In the previous periods, the US index shows a much lower level of solar activity than the European one, and this causes confusion and contradictions when the number of sunspots is used in modern research regarding the solar dynamo or the solar forcing on the Earth's climate system, for example". The historical study of sunspots has led to the detection of several errors in the two versions. Their authors, from centres such as the Royal Observatory of Belgium, Stanford University and the US National Solar Observatory, have also been able to correct some of the detected incidents. To carry out this research, Spain has provided information from the catalogue of sunspots from the Observatory of the University of Valencia, created between 1920 and 1928 before its fire, and data from the Astronomical Observatory of Madrid recorded between 1876 and 1986. More information: Frédéric Clette, Leif Svalgaard, José M. Vaquero y Edward W. Cliver. "Revisiting the Sunspot Number A 400-Year Perspective on the Solar Cycle". Space Science Reviews, 2014. DOI: 10.1007/s11214-014-0074-2. A. J. P. Aparicio, J. M. Vaquero, V. M. S. Carrasco, M. C. Gallego. "Sunspot Numbers and Areas from the Madrid Astronomical Observatory (1876?-?1986)" y "Sunspot Catalogue of the Valencia Observatory (1920-1928)". Solar Physics 289 (11), 2014. Suddenly, the sun is eerily quiet: Where did the sunspots go?